Adventures In Storytime (and Beyond): Flannel Friday: "Five Little Snowmen"
This is my version of a "Five Little Snowmen" rhyme and "flannel" board I first saw on MissMaryLiberry. 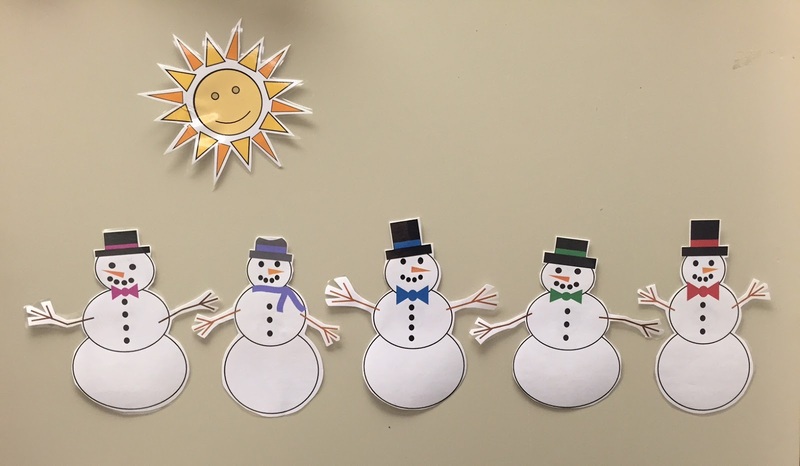 She created snowmen using MS Word's "shapes" drawing feature. I really liked hers, but wanted to make a couple of changes and to play around with it myself. So I made my own last winter using the same "shapes" tool in MS Publisher. And, of course I have to make things more complicated than necessary, so I decided instead of making them all the same with only different colored hat bands I would make them all just a little different by changing hat shapes, making some more elliptical than round, different numbers of buttons, different arms, etc. 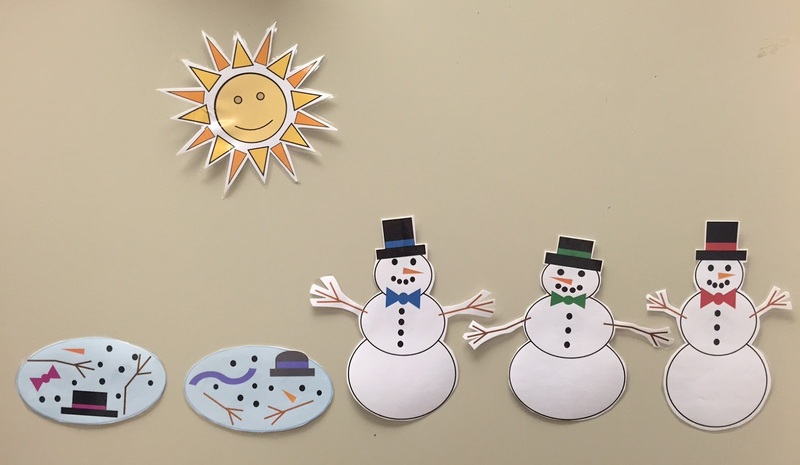 I start with the snowmen on the board, with the puddles behind them (I did not think of doing it this way as I was drawing them, so the puddles are a little wider than the snowmen and won't be completely covered). I do a quick run-thru of the first verse to teach the audience the hand motions, then start over from the beginning. I add the sun when we mention it in the first verse. As each snowman melts in the rhyme, I remove one from the board, leaving the melted puddle in it's place. 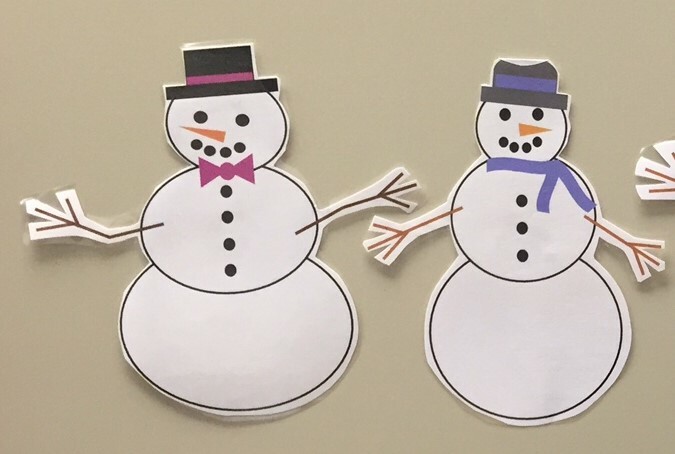 You can use the links below to download the snowmen files from Google file sharing. I scaled them to two smaller sizes after realizing I had initially made them much too large to fit on my small travel board. After we did the rhyme the traditional way with the flannel board, I then made a game out of it. I had all the children stand in a circle, and as we said the rhyme I would walk around behind them as the "Sun". When we got to the line where "one little snowman melted away" I would put my hand(s) on one or two kids' shoulders to indicate they were the snowman that had to melt away, and they would "melt" down to the floor. We all had a lot of fun doing it this way, and they loved the suspense of seeing who would have to melt next. Another variation is instead of chanting it as a rhyme, you can sing it as a song to the tune of "Five Little Ducks Went Out To Play". To see more Flannel Friday posts from other bloggers, go to this week's Flannel Friday Round-Up hosted by Mollie at "What Happens In Storytime...". For more information about Flannel Friday and how to participate, visit the Flannel Friday site.